M98 is a rare blueshifted galaxy. M98, a galaxy that, for a short time, is swimming upstream against the expansion of the Universe. All in all, it’s quite lovely, and that shot by the New Technology Telescope really shows it off. There’s no danger of a collision! At its speed of 150 km/sec, it would take a hundred billion years to get here, so don’t wait up. Also, it’s probably not heading directly at us, because it’s part of the Virgo Cluster, a grouping of about thousand galaxies bound by their own gravity. It’s the closest true cluster to us, and our own small Local Group of a couple dozen galaxies is like a small town near a bigger one. M98 is part of the Virgo Cluster, so it’s in orbit around the cluster center. We’re way outside the cluster, so it can’t hit us. 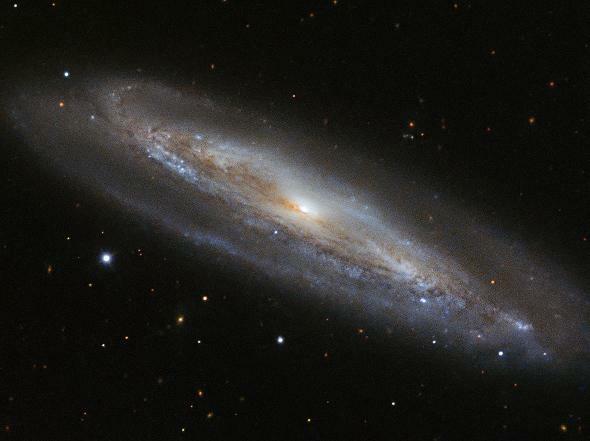 One example of this is the monstrous Andromeda galaxy, which is headed toward us at high speed. We actually will collide with it, though not for quite some time (like, 4 billion years). But it shows a distinct blueshift in its light; it’s moving around faster than space is expanding.